Solomon packed more experience into one lifetime than most people dream of. He built the great temple in Jerusalem and numerous other projects. He studied and taught about many aspects of nature: animals, birds, reptiles, fish and plant life (1 Kings 4:32-34). He had 700 wives and 300 concubines. He wrote songs and spoke proverbs, many of which are preserved in the book of Proverbs. Toward the end of his life, Solomon looked back on what he had learned. He recorded his observations in what is now known as the book of Ecclesiastes. One might expect Solomon to have been satisfied and grateful as he reflected on a life of achievement. In fact, he was frustrated and bitter. Solomon revealed his thesis in the opening statement “Everything is meaningless” (verse 2), which also occurs toward the end of the book (Ecclesiastes 12:8), forming an envelope structure. Solomon’s work expounds his view that everything is futile. This is true when we leave God out of the picture. “The heavens declare the glory of God; the skies proclaim the work of his hands. Day after day they pour forth speech; night after night they display knowledge…. In the heavens he has pitched a tent for the sun, which is like a bridegroom coming forth from his pavilion, like a champion rejoicing to run his course. It rises at one end of the heavens and makes its circuit to the other” (Psalm 19:1-6). “The wind blows to the south and turns to the north; round and round it goes, ever returning on its course. All streams flow into the sea, yet the sea is never full. To the place the streams come from, there they return again. All things are wearisome, more than one can say. The eye never has enough of seeing, nor the ear its fill of hearing” (Ecclesiastes 1:6-8). Where David sees a wondrous renewal, Solomon sees futility. Solomon proclaims: “What has been will be again, what has been done will be done again; there is nothing new under the sun” (verse 9). Solomon had asked what a man’s work was worth (Ecclesiastes 1:3); now he answers his question: “I have seen all the things that are done under the sun; all of them are meaningless, a chasing after the wind” (verse 14). Solomon had become the wisest person on earth. But his wisdom did not bring happiness:”For with much wisdom comes much sorrow; the more knowledge, the more grief” (verse 18). Solomon then sought pleasure in wine, women and song. He experienced every physical sensation he could: “I denied myself nothing my eyes desired; I refused my heart no pleasure” (Ecclesiastes 2:10). But pleasure did not bring him happiness either: “Everything was meaningless, a chasing after the wind; nothing was gained under the sun” (verse 11). Solomon knew that “wisdom is better than folly, just as light is better than darkness” (verse 13). However, being wise, he also knew that “the wise man, like the fool, will not be long remembered…. Like the fool, the wise man too must die!” (verse 16). The melancholic mood here is emphasized in Hebrew both by the meter and by the Hebrew word ’eikh, which is an exclamation of pain or grief. Solomon was bitter that, having had every advantage in life, he had no advantage in death. This bitterness increased until he ended up hating even life itself (verse 17). Solomon had embarked on great building projects. The kingdom of Israel had prospered and reached its highest point during his reign. Solomon hated leaving all he had labored for to his successor, who might be a fool (verses 18-19). This he considered a great misfortune (verse 21). However, not all of Ecclesiastes is negative. Solomon acknowledged that “a man can do nothing better than to eat and drink and find satisfaction in his work” (verse 24). He also knew that God blesses the good person but not the sinner (verse 26). But in the light of eventual death for all, Solomon viewed even this as “meaningless, a chasing after the wind” (verse 26). Then follows another passage on seasons and cycles in life. Solomon observes, “There is a time for everything, and a season for every activity under heaven” (Ecclesiastes 3:1). Solomon lists how everything has its appropriate time, beginning with the issue uppermost in his mind: “a time to be born and a time to die” (verse 2). Considering that many people find lists in the Bible quite boring, it is interesting to note that the list in verses 1-8 is one of the more commonly quoted sections of Ecclesiastes and formed the lyric for a popular song in modern times. Solomon asks again, “What does the worker gain from his toil?” (verse 9). This question introduces another passage on work. Solomon repeats what he has said before: People should enjoy their labor, their God-given task, and should eat, drink and enjoy themselves (verses 10-13). But only God’s works last forever (verse 14). From discussing the fleeting nature of human works, Solomon proceeds to claim that humanity is eventually no better than the animals: “Man has no advantage over the animal. Everything is meaningless. All go to the same place; all come from dust, and to dust all return” (verses 19-20). Not only are the wise and the foolish equal in death, but so are people and animals! Since death is the eventual end for all, Solomon concludes that there is nothing better for people than to rejoice in their work, in their brief portion of life (verse 22). Solomon had observed oppression and injustice and made this bitter conclusion: “I declared that the dead, who had already died, are happier than the living, who are still alive. But better than both is he who has not yet been, who has not seen the evil that is done under the sun” (Ecclesiastes 4:2-3). In this cynical mood, he considered that “all labor and all achievement spring from man’s envy of his neighbor” (verse 4). Solomon spoke about the futility of selfishness and of the value of friendship (Ecclesiastes 4:8-12). He warned against making hasty vows (Ecclesiastes 5:1-7). He told how the acquisition of money and material goods does not bring lasting satisfaction (verses 10-17). Then he repeated that there was still nothing better than to busy oneself with work and enjoyment, for then one would not think on the brevity of one’s life (verses 18-20). God gave Solomon riches, wealth and honor, but Solomon was still frustrated: “God gives a man wealth, possessions and honor, so that he lacks nothing his heart desires, but God does not enable him to enjoy them, and a stranger enjoys them instead. This is meaningless, a grievous evil” (Ecclesiastes 6:2). 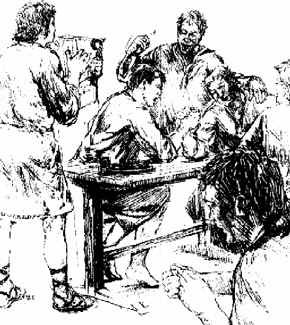 Again, Solomon asked bitterly, “What advantage has a wise man over a fool?” (verse 8). The first half of the book concludes: “This too is meaningless, a chasing after the wind” (verse 9). Now Solomon uses a series of “better than” statements to present his teachings. The first one begins conventionally enough: “A good name is better than fine perfume” (Ecclesiastes 7:1). The Hebrew is just four words long — tobh shem mishemen tobh. The two tobhs (“good”) form an envelope for the other two words. There is also a wordplay on shem (“a name”) and mishemen (“than oil”). The whole construction is ideal for conveying a standard piece of wisdom: A good reputation is of greater value than material goods. But the second half of the verse strikes a different chord entirely:”And the day of death better than the day of birth” (verse 1). Solomon’s obsession with death continues: “It is better to go to a house of mourning than to go to a house of feasting, for death is the destiny of every man; the living should take this to heart. Sorrow is better than laughter, because a sad face is good for the heart” (verses 2-3). Even in this depressed state of mind, Solomon was able to continue imparting wisdom: “It is better to heed a wise man’s rebuke than to listen to the song of fools” (verse 5); “The end of a matter is better than its beginning, and patience is better than pride” (verse 8); and “Wisdom is a shelter as money is a shelter, but the advantage of knowledge is this: that wisdom preserves the life of its possessor” (verse 12). Solomon’s bitterness toward life is also reflected in his own failure to form a satisfactory marital relationship. He says, “I find more bitter than death the woman who is a snare, whose heart is a trap and whose hands are chains” (Ecclesiastes 7:26). Solomon apparently did not have a happy relationship with any one of his 700 wives or 300 concubines. Solomon did not deny the possibility of others finding happiness in marriage. However, only once in Ecclesiastes does he mention any joys he felt a wife might bring, and even then he qualifies his statement by saying that all such joys are ultimately futile: “Enjoy life with your wife, whom you love, all the days of this meaningless life that God has given you under the sun — all your meaningless days” (Ecclesiastes 9:9). Nor does Solomon deny that at some point those who fear God will be better off than those who do not (Ecclesiastes 8:12-13). But he still dwells on the certainty of death: “All share a common destiny — the righteous and the wicked, the good and the bad, the clean and the unclean…. This is the evil in everything that happens under the sun: The same destiny overtakes all…they join the dead” (Ecclesiastes 9:2-3). Therefore, Solomon recommends getting all you can from this life: “For the living know that they will die, but the dead know nothing” (verse 5); and “Whatever your hand finds to do, do it with all your might, for in the grave, where you are going, there is neither working nor planning nor knowledge nor wisdom” (verse 10). Again, Solomon affirms the value of wisdom but states bitterly that it is disregarded: “‘Wisdom is better than strength.’ But the poor man’s wisdom is despised, and his words are no longer heeded…. Wisdom is better than weapons of war, but one sinner destroys much good” (verses 16, 18). At times, Solomon lists one proverb after another, with little or no connection between them. However, many of these diverse proverbs have one thing in common — they show the negative effects of certain courses of action. Solomon often illustrates the dire consequences of folly, but he rarely inspires readers with the good consequences of wisdom. We shall examine one proverb typical of the style found throughout Ecclesiastes: “If clouds are full of water, they pour rain upon the earth. Whether a tree falls to the south or to the north, in the place where it falls, there will it lie. Whoever watches the wind will not plant; whoever looks at the clouds will not reap” (Ecclesiastes 11:3-4). First, notice the envelope structure — the first and last parts of the proverb concern the clouds, and the middle parts concern the wind uprooting a tree. The proverb shows that natural events are going to occur whatever you do, so there is no excuse to stop working just because you think the weather may turn bad. What makes this proverb so typical of Ecclesiastes is the mood it conveys. A proverb imparting wisdom is placed in a pessimistic setting — natural disasters occur no matter what you do. Toward the end of the book, Solomon repeats his advice to enjoy life while we can, but to remember always how vain and fleeting it is. He says: “However many years a man may live, let him enjoy them all. But let him remember the days of darkness, for they will be many. Everything to come is meaningless” (Ecclesiastes 11:8). Solomon says to the young man: “Be happy, young man, while you are young, and let your heart give you joy in the days of your youth. Follow the ways of your heart and whatever your eyes see, but know that for all these things God will bring you to judgment…. For youth and vigor are meaningless” (verses 9-10). Solomon emphasizes this last point with his concluding passage. He first makes the positive statement, “Remember your Creator in the days of your youth” (Ecclesiastes 12:1). “Before the sun and the light and the moon and the stars grow dark, and the clouds return after the rain…when the almond tree blossoms and the grasshopper drags himself along…before the silver cord is severed, or the golden bowl is broken; before the pitcher is shattered at the spring, or the wheel broken at the well” (verses 2-7). The passage as a whole includes metaphors for loss of sight, teeth, hearing and sexual desire, followed by eventual death. Solomon ends his description: “And the dust returns to the ground it came from, and the spirit returns to God who gave it” (verse 7). The last six verses form an epilogue to the book. This passage, which was probably added later, refers to “the Teacher” in the third person. The epilogue draws some conclusions about the book as a whole. It tells us that the Teacher, Solomon, was wise and that the words of the wise are like goads or prods. In spite of the pessimistic attitude, which we should avoid, there is much wisdom we can learn in Ecclesiastes. The author of the epilogue now reflects on Solomon’s experience and draws a sober conclusion: “Fear God and keep his commandments, for this is the whole duty of man” (verse 13).